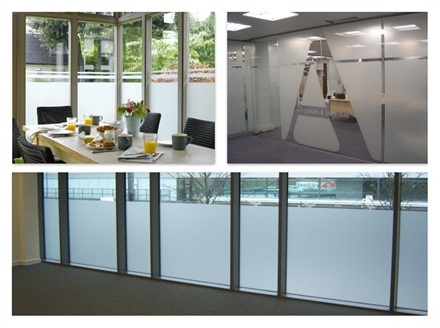 Frosted window film is a multi-purpose product, suitable for use in a range of situations. Providing your glazing with a traditional frosted, sand-blasted effect, this high quality film provides a range of cost effective, functional and decorative opportunities. An application of frosted window film will immediately transform glazing, giving it the appearance of frosted glass without the need for costly window replacements. Frosted glass can provide a solution to a range of solutions, and with a nationwide installation service and online store for DIY installation, there is a product and service that will suit both commercial and residential customers. When you fit the frosted window film yourself, you will need to know how to apply frosted glass film, but don't worry, it is quite easy to apply if you take your time and read the window frosting film fitting instructions. Frosted film for your glass window is not only a great alternative to net curtains but you can add styles and patterns too, with our range of decorative window films or printed white frosted window film. To get the look of frost etched glass, but that is very easy to clean, you just need to choose from the range of window film you like and the follow the installation instructions, using soapy water and the special installation tool we send with every order to apply the adhesive film to your glass. Alternatively, you can choose to get your window film installation done professionally by calling us on 01494 794477 to get a window film installation quote. Commercial Frosted Window Film can be used for various applications, the high quality and durable nature of the film ensuring a high level of performance in each. Window Privacy can be achieved with a single application of frosted window film. The nature of the film prevents vision from both sides of the glass without sacrificing natural light; frosted film allows a high level of light transmission. Glass Manifestation is required in a range of situations, with legislation requiring glass to be made visible. Frosted window film provides the ideal material for creating manifestation in a range of designs and styles. Company Logos and Branding can all be created using frosted window film. Logos and other design elements can be printed onto the film, whilst computer cutting designs from frosted film can provide an eye-catching addition to windows and glass partitions. Residential Frosted Window Film continues to be an increasingly popular choice for both privacy and decorative purposes in the home. The contemporary appearance of frosted film provides an attractive finish, whatever the purpose of the installation. Decorative Glass Effects are a fantastic way of creating an aesthetically pleasing feature of your windows. By computer cutting designs from the frosted film, it is possible to create designs ranging from the simple to the intricate. Glass Privacy in the home is required for a number of reasons, and frosted window film provides the perfect solution. By applying frosted film to all or part of your window, the vision will be obscured, whilst natural daylight will continue to pass through the glass. Frosted film ensures elegant and stylish privacy. DIY Frosted Window Film is available for those who want to install the film themselves, whilst the nationwide installation service is available for both commercial and residential customers that require a professional installation. DIY film is available from our online store, whilst for an installation quote you can contact us on 01494 794477. Frosted Window Film Patterns are available to buy quickly and easily from our online store. You can choose from a wide range of patterns, which will be computer cut out of the frosted film. Your film will be cut to your exact size specification, to ensure a perfect fit for each of your windows. Off the roll Frosted window film is also available to purchase by the metre, with full 30 metre rolls of selected film available at special rates. For further details about our range of frosted films, or to obtain a quote for installation, call 01494 794477 to speak to one of our expert members of staff.